Do you have nagging leaks and are not sure where they are coming from? Water damage can occur almost anywhere in your house. 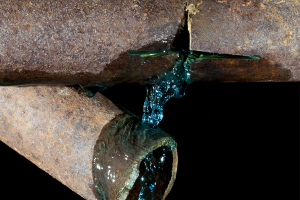 Unfortunately, water leaks are rarely noticed until it is too late. Even small or slow water leaks throughout the home can cause significant damage. When a substantial amount of water is discharged it can lead to rotting and mold within the house. At Rodger’s Plumbing, our Leak Detection services vary from using electronic line tracing devices, and in line sewer cameras, to sending out our specialist to do a visual inspection. Our plumbers have the ability and equipment to determine the exact location of a leak. Once the source of the leak is identified and pinpointed, the technician can then recommend the best method to repair it. A majority of plumbing leaks can go unnoticed. Be aware and look for signs that may indicate if you have a leak or not. Slab leaks can be problematic because of the challenge in accessing them to make the repairs. Pipes that run under or behind a slab of concrete in your home, whether it is under the foundation, or in another location, are the cause of what is known as a slab leak. Gas leaks are caused by wear and tear with fittings that either leak underground, in walls and below a structure or appliances that have been incorrectly installed and poorly maintained. Gas Leak detection is not something you should take lightly. A gas leak is an unexpected release of gas creating a dangerous situation because gas is poisonous and harmful. The smallest of leaks can accumulate and ignite to cause an explosion. We have been serving the Dallas, TX Metroplex area and the surrounding communities of Frisco, Hebron, Mckinney, North Irving, North Mesquite, Rowlett, Murphy, Wylie, Sachse, Garland, Allen, North Dallas, Richardson, Plano, Carrollton, Addison, Farmers Branch, Coppell, Highland Park, and University Park since 1970!